WARHORSE – Nick Simper’s new band released their first single St. Louis on Vertigo in February in the UK. 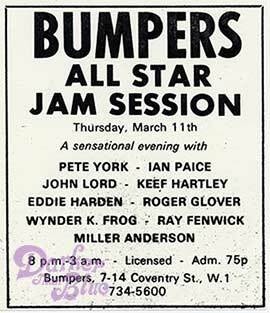 Drummer Pete York organised a few one-off jams in London, and this one featured Ian Paice, Jon Lord and Roger Glover along with other guests. The band were on a break from touring, and made a couple of visits to the studio around this time to work on Fireball, as well as some sessions for Jon’s Gemini Suite album. Deep Purple hadn’t played in the UK for a while and had been in the studios finishing Fireball. Their managers slipped in a couple of shows, possibly at the request of the band, to help them get in shape for a big American tour (and possibly because they were offered £1000+ fees). The Melody Maker review shows they included two new tracks, Anyone’s Daughter and Demon’s Eye, at this show. Demon’s Eye was kept for the subsequent American shows but then dropped. Quiver were an interesting but short lived prog rock outfit. 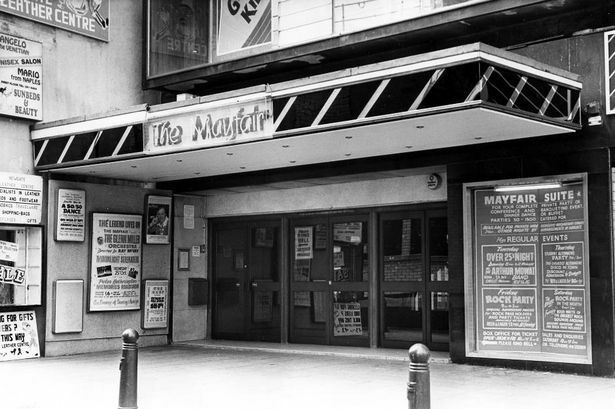 Newcastle’s Mayfair Ballroom opened in 1961 and began putting on pop bands in the middle of the decade (including what is now thought to be Led Zeppelin’s first ever UK show in late 1968.) 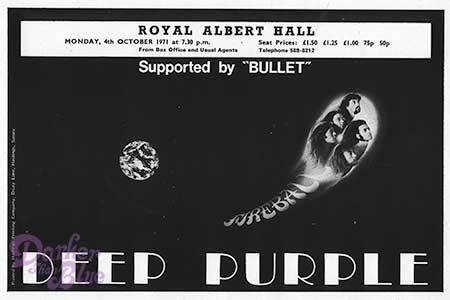 Deep Purple Mk 2 had been scheduled to play an early show there in 1969 (it had to be cancelled), but got there in July 1970 and surprisingly returned in 1971 for the gig shown in the advert above (90p a ticket) when normally they would have played somewhere bigger like the City Hall. I suspect it was arranged at short notice. The venue was set up for 1,500 dancers, but could take up to 3,000 for a rock concert and when it closed at the end of the 1990s 5,000 people are said to have attended the final night. It is probable that Deep Purple played the new tracks at this second one-nighter as well but no recording has come to light so far. The stage (not set up for Deep Purple!) photo : Tyne & Wear Archives. If you know the Brit gangster film Get Carter, then the ballroom scene in that was all filmed here. It gives a real sense of the atmosphere of a rock club in 1971 (the year the film came out), though despite freeze framing through the sequence we’ve yet to see any Deep Purple posters on the wall. The Newcastle venue is now the subject of a forthcoming book, detailing the history of the venue as well as the gigs which took place there. If you come from the area and have any tickets or memories of the place, do visit the website and get in touch with Marshall Hall (who as a member of local band Hot Snax trod the boards there himself in 1980). Much of the building was cleared in 1999 for a shopping centre but the venue downstairs survives though being turned into a gym. 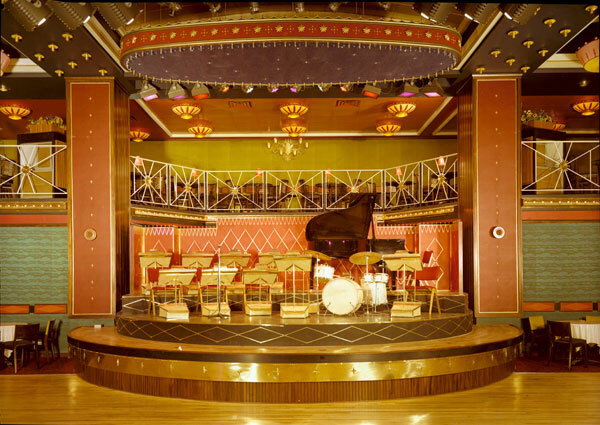 If you’re into the architecture of entertainment you can see some amazing pictures taken when it was new here. 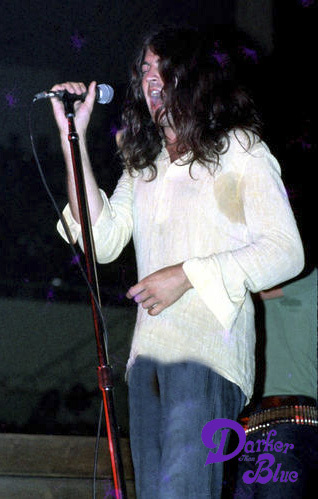 Jul 28, 1971, Sam Houston Coliseum, Texas. Deep Purple’s first proper American tour was a solid month of shows, most of which were decent size venues with the band second on the bill to The Faces, with Matthew’s Southern Comfort opening the evening. The Mk 2 band hadn’t been able to tour there before (apart from a few shows around the time of the US Concerto) but with In Rock having done so well in Europe it was time to try and break them in America, and the shows directly supported the Fireball album which was issued by Warners there during the tour. The band did a shortish set based around Speed King, Child In Time and Mandrake Root with the new single Strange Kind Of Woman. The tour did the job and Warners reported selling 55,000 copies of Fireball in just three days as a result. The band were also earning $3,000 a night on average. Underarm deodorant cost extra! On the 28th the band played the Sam Houston Coliseum and reportedly went down a storm according to local enthusiasts. 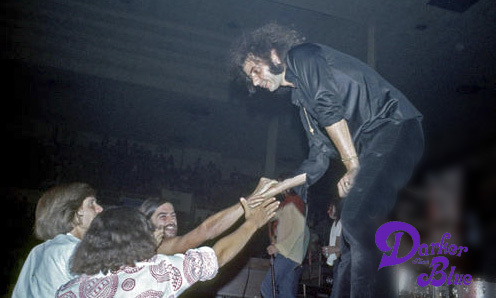 Here are two great photos from the show, including one of Ritchie shaking hands with some enthusiastic fans. The general opinion is that they blew The Faces off stage most nights. Although ostensibly promoting their Fireball album, as shown on the tour poster above, the Autumn 1971 UK tour actually saw the group add Highway Star and Lazy to the set, which had yet to be recorded. The Albert Hall concert was their big London show. They had played here before supporting Canned Heat (and in 1969 for The Concerto). This time they had Purple label band Bullet on the bill with them. 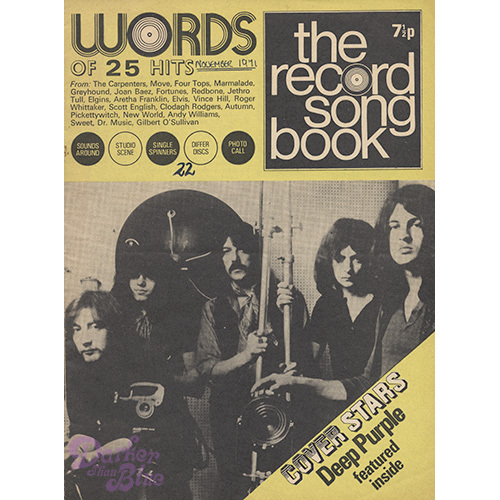 Deep Purple make it to the cover of the popular magazine The Record Song Book, one of the first in Britain to show them on the front. Inside a half page feature on the group and the new album Fireball, on which we learn that Ian Gillan is “tossing his words about within the capacious and gritty instrumental vortex”! that they did it just for fun); anyone confirm? the movie story involved a rock drummer. The film story is correct, but they ran out of time during what was a very busy year. Shame. A friend and I attended the early July stop at the Spectrum in Philly – we’d signed up to see Rod and the Faces, this was their support tour for “Every Picture Tells a Story” – but when DP came out and blew the roof off the Spectrum with the opening of Speed King, we were hooked. I’d had the “Shades” album since way back but had no idea of the intervening metamorphosis of the group. A friend of mine was at this show. He said Deep Purple were impressive. Late July is the HOT season in Houston and it can be oppressively hot and humid. The Sam Houston Coliseum was the big venue back then (Houston’s hockey team in the 70s played there), but I bet they skimped on the AC for these rock concerts. It must have been hot as hell in there! They look beat in the photos. $3000 a night? I was a little too young to make this show, but luckily saw them a couple years later for the huge Astrodome Burn tour. I bet they were making a bit more than $3000 a night by then! Great pics.